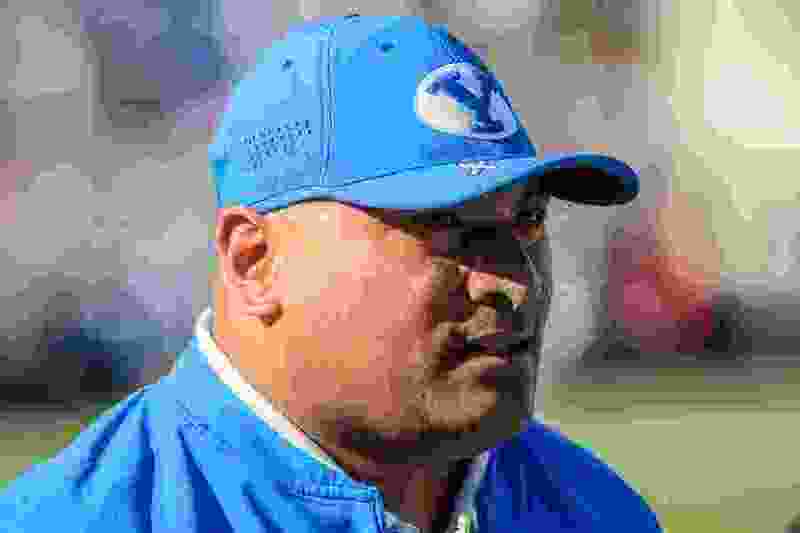 (Trent Nelson | The Salt Lake Tribune) Brigham Young Cougars head coach Kalani Sitake as BYU hosts Northern Illinois, NCAA football in Provo, Saturday Oct. 27, 2018. Provo • With spring football practices scheduled to conclude on Thursday, BYU added some depth to its offensive backfield on Wednesday. The Cougars announced the signing of Rice running back Emmanuel Esukpa, a graduate transfer who will be eligible to play for them this fall. Esukpa, 5-foot-11, 232 pounds, will be a redshirt senior and will reunite with BYU running backs coach AJ Steward, who recruited him to Rice several years ago. Esukpa graduated from Mansfield High in Grand Prairie, Texas, and is scheduled to graduate from Rice this spring with a degree in sports management. Esukpa had 122 carries for 461 yards and three touchdowns last season. In all, he played in 29 games and finished with 196 carries for 778 yards and six TDs. It has been a busy past couple of days for BYU’s coaching staff, which held an open practice and scrimmage on Saturday in conjunction with Junior Day and also picked up several new commitments from high school football players who will comprise the class of 2020. • Most notably, Corner Canyon linebacker Josh Wilson — brother of BYU quarterback Zach Wilson — posted his commitment to BYU on Twitter on Tuesday night. Healthy tight ends are in short supply at BYU spring football practices this month. Where have they gone, and what are coaches doing about it? • Also Tuesday night, Timpview High’s Logan Pili a 6-1, 205-pound safety and linebacker, announced that he has committed to BYU. He is the younger brother of current BYU players Trajan Pili and Keenan Pili. Trajan Pili was a starter at defensive end last season for the Cougars, but played some mike linebacker in the spring scrimmage on Saturday. • After the scrimmage on Saturday, Tooele High’s Nukuluve Helu announced his commitment to BYU. Helu, 6-1, 205, attended Junior Day and made the commitment shortly after the spring scrimmages. He has played linebacker and defensive end for the Buffaloes. BYU now has six commitments from the class of 2020, according to 247sports.com. Bishop Gorman (Las Vegas) outside linebacker Dehlin Mesake, American Fork outside linebacker Bodie Schoonover and Othello (Wash.) High defensive end Isaiah Perez are also on the list.